It would be helpful to know your timeline, what you are looking to find. For example, if you hope to get a silver gray female pup in the next three months, we would have an idea what we might be able to tell you about the chances of us having one born. Check as many boxes as you want. If you want more information, select the last category--Send me the Email -- Welcome to OwyheeStar. In order to access the formal application, you will need a password. You must get the password from Shela. You can use this request to ask for the password or email. 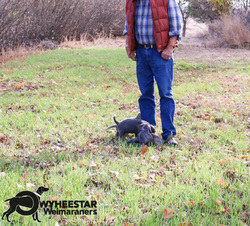 Note: Information on OwyheeStar puppy pricing is listed above. Select the tab labeled Puppies, and you will find a Pricing tab. Another place to get your questions answered, is on the OwyheeStar Blog FAQs--Click Here! Availability often changes without advance notice. OwyheeStar does their best to keep information updated, but there are times a pup may be available and not listed. Other times a pup which is pictured or listed may have already been placed. If you are serious about an OwyheeStar Weimaraner puppy, the best approach is to complete the formal application process. The more information gathered, the better the odds are that things come together easily. An approved application gets more attention than numerous random emails. The sheer email volume can be daunting. They appreciate your understanding. The focus is on the pup's placement in the best possible forever family for their well-being. In addition, this means understanding your wants and needs (as well as your lifestyle). OwyheeStar, ( Cliff and Shela ) Thank you for your interest. Please make all inquiries via email or this website.